The Harvard Crimson football program represents Harvard University in college football at the NCAA Division I Football Championship Subdivision (formerly Division I-AA). Harvard's football program is one of the oldest in the world, having begun competing in the sport in 1873. The Crimson has a legacy that includes thirteen national championships and 20 College Football Hall of Fame inductees, including the first African-American college football player William H. Lewis, Huntington "Tack" Hardwick, Barry Wood, Percy Haughton, and Eddie Mahan. Harvard is the eighth winningest team in NCAA Division I football history. The Harvard Crimson was one of the dominant forces in the early days of intercollegiate football, winning 9 college football national championships between 1890 and 1919. In both 1919 and 1920, headed by All-American brothers Arnold Horween and Ralph Horween (who also attended Harvard Law School), Harvard was undefeated (9–0–1, as they outscored their competition 229–19, and 8–0–1, respectively). The team won the 1920 Rose Bowl against the University of Oregon, 7–6. It was the only bowl appearance in Harvard history. In the forty-year period from 1889 to 1928, Harvard had more than 80 first-team All-American selections. Under head coach Percy Haughton, Harvard had three consecutive undefeated seasons from 1912 to 1914, including two perfect seasons in 1912 and 1913. The NCAA decided to split Division I into two subdivisions in 1978, then called I-A for larger schools, and I-AA for the smaller ones. The NCAA had devised the split, in part, with the Ivy League in mind, but the conference did not move down for four seasons despite the fact that there were many indications that the ancient eight were on the wrong side of an increasing disparity between the big and small schools. In 1982, the NCAA created a rule that stated a program's average attendance must be at least 15,000 to qualify for I-A membership. This forced the conference's hand, as only some of the member schools met the attendance qualification. Choosing to stay together rather than stand their ground separately in the increasingly competitive I-A subdivision, the Ivy League, along with several other conferences and independent programs moved down into I-AA starting with the 1982 season (a number of these teams have since returned to I-A/FBS). Since the formation of the Ivy League in 1956, Harvard has won outright or shared 17 Ivy League championships (8 outright; 9 shared), 1961 (6–3), 1966 (8–1), 1968 (8–0–1), 1974 (7–2), 1975 (7–2), 1982 (7–3), 1983 (6–2–2), 1987 (8–2), 1997 (9–1), 2001 (9–0), 2004 (10–0), 2007 (8–2), 2008 (9–1), 2011 (9–1), 2013 (9–1), 2014 (10–0) and 2015 (9–1). The Crimson are behind Penn and Dartmouth's 18 Ivy League Football Championships. Harvard has won 12 national championships (1874, 1875, 1890, 1898, 1899, 1901, 1908, 1910, 1912, 1913, 1919, 1920) from NCAA-designated major selectors. :110–111 Harvard claims seven of these college football national championships. Harvard has won seventeen conference championships, all of which occurring during their tenure in the Ivy League, which they joined in 1956, with eight of them being outright and nine being shared. They are second in total Ivy League football titles, behind Dartmouth and Penn. In over a century of play, Harvard has had numerous head coaches, with varying success. Harvard and Yale have been competing against each other in football since 1875. The annual rivalry game between the two schools, known as "The Game", is played in November at the end of the football season. As of 2015, Yale led the series 65–59–8. The Game is the second oldest continuing rivalry and also the third most-played rivalry game in college football history, after the Lehigh–Lafayette Rivalry (1884) and the Princeton–Yale game (1873). Sports Illustrated On Campus rated the Harvard–Yale rivalry the sixth-best in college athletics in 2003. Ted Kennedy played football for Harvard and caught a touchdown pass in the 1955 Harvard/Yale game. In 2006, Yale ended a five-game losing streak against Harvard, winning 34–13. That Harvard winning streak was third longest in the history of the series, after Yale's 1902–1907 six-game winning streak and Yale's 1880–1889 eight-game winning streak. Harvard has since beaten Yale in 2007, 2008, 2009, 2010, 2011, 2012, 2013, 2014 and 2015. The Game is significant for historical reasons as the rules of The Game soon were adopted by other schools. Football's rules, conventions, and equipment, as well as elements of "atmosphere" such as the mascot and fight song, include many elements pioneered or nurtured at Harvard and Yale. The series with Dartmouth dates to 1882. The series with Penn dates to 1881. The series with Princeton dates to 1877. Harvard Stadium is a horseshoe-shaped football stadium in the Allston neighborhood of Boston, Massachusetts, in the United States. The stadium is an important historic landmark. Built in 1903, it is the nation's oldest stadium. Penn's Franklin Field is the oldest site still in use (1895) but its current stadium was built in 1922. It was also the world's first massive reinforced-concrete structure, and considered at the time of construction to be the 'finest structure of its kind in the world'. However, the structure was completed in just six months, mainly by the efforts of Harvard students, and for a budget of $200,000. Thus 'the stadium represents the thought, the money, the ideas, the planning, and the manual labor of Harvard men'. As such, it is one of four athletic arenas distinguished as a National Historic Landmark (the Los Angeles Memorial Coliseum, Rose Bowl and the Yale Bowl are the other three). The stadium seats 30,323. Temporary steel stands were added in the stadiums to expand capacity to 57,166 until 1951. Afterward, there were smaller temporary stands until the building of the Murr Center (which is topped by the new scoreboard) in 1998. In 2006, Harvard installed both FieldTurf and lights. As of 2018, 18 Harvard Crimson football players and 3 coaches have been inducted into the College Football Hall of Fame. Tackle Marshall Newell was a four-time All-American from 1890–1893. Over 30 players from Harvard have gone on to play in the National Football League. 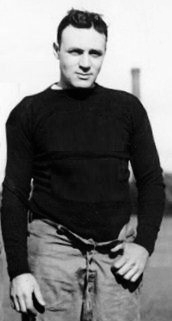 Three-time All-American Eddie Mahan was named by Jim Thorpe as the greatest football player of all time. Two-time All-American Hamilton Fish III served 25 years in Congress where he investigated the ACLU for ties to the Communist Party. Huntington "Tack" Hardwick was called "a big, fine-looking aristocrat from blue-blood stock" who "loved combat – body contact at crushing force – a fight to the finish." Since the first All-American team was selected by Caspar Whitney in 1889, more than 100 Harvard football players have been selected as first-team All-Americans. Consensus All-Americans are noted below with bold typeface. ^ "NCAA Football Bowl Subdivision Records" (PDF). National Collegiate Athletic Association. 2009. pp. 62–63. Retrieved October 27, 2010. ^ "NCAA Football Championship Subdivision Records" (PDF). National Collegiate Athletic Association. 2009. p. 172. Retrieved October 27, 2010. ^ "Harvard Football National Championships". Retrieved October 18, 2011. ^ a b c d e f g h Official 2009 NCAA Division I Football Records Book (PDF). Indianapolis, IN: National Collegiate Athletic Association. August 2009. pp. 78–79. Retrieved November 3, 2010. ^ "Horween, Ralph". Jews In Sports @ Virtual Museum. Archived from the original on March 17, 2013. Retrieved March 24, 2013. ^ "Horween, Arnold". Jews In Sports @ Virtual Museum. March 3, 2013. Archived from the original on March 13, 2013. Retrieved March 24, 2013. ^ Jack Cavanaugh (2010). The Gipper: George Gipp, Knute Rockne, and the Dramatic Rise of Notre Dame Football. Skyhorse Publishing. Retrieved March 23, 2013. ^ The New York Times Biographical Service. New York Times & Arno Press. 1997. Retrieved March 22, 2013. ^ Ralph Goldstein (May 29, 1997). "Ralph Horween, 100, the Oldest Ex-N.F.L. Player". New York Times. Retrieved March 19, 2013. ^ Dale Richard Perelman (2012). Centenarians. Retrieved March 21, 2013. ^ "A League First: Former Player Turns 100". New York Times. August 4, 1996. Retrieved March 23, 2013. ^ a b "Media Center: Harvard Crimson Football All-American Selections". GoCrimson.com. ^ "Harvard Yearly Results (1910–1914)". College Football Data Warehouse. ^ "Harvard Composite Championship Listing". College Football Data Warehouse. ^ Christopher J. Walsh (2007). Who's #1? : 100-Plus Years of Controversial National Champions in College Football. Taylor Trade Pub. p. 122. ISBN 978-1-58979-337-8. ^ 2018 NCAA Football Bowl Subdivision Records (PDF). Indianapolis: National Collegiate Athletic Association. August 2017. Retrieved September 4, 2018. ^ > "Harvard Football National Championships". Retrieved August 20, 2018. ^ "Media Center: Harvard Crimson Football – Ivy League Championships". gocrimson.com. ^ "Harvard Coaching Records". College Football Data Warehouse. ^ "Harvard Crimson Football Record By Year - College Football at Sports-Reference.com". College Football at Sports-Reference.com. ^ Thomas G. Bergin (1984). The Game: The Harvard-Yale Football Rivalry, 1875–1983. Yale University Press. ^ Bernard M. Corbett and Paul Simpson (2004). The Only Game That Matters. Crown. ISBN 1-4000-5068-5. ^ "Harvard's Great Stadium" (PDF). New York Times. November 22, 1903. ^ "Harvard Stadium History". Harvard Crimson. ^ "Harvard Stadium: Home of Harvard Football and Lacrosse Harvard Stadium Notes". Harvard University. ^ "Harvard Stadium Football History". Harvard University. ^ "Hall of Fame Inductee Search". College Football Hall of Fame. Retrieved September 17, 2018. ^ Grantland Rice (July 6, 1949). "Hardwick of Harvard". Miami Daily News. ^ a b Knobler, Mike (December 1, 1982). "Harvard's Corbat Named To All-America Team | Sports | The Harvard Crimson". Thecrimson.com. Retrieved October 22, 2012. ^ "Harvard : Media Center: Harvard Crimson Football All-American Selections". Gocrimson.com. Retrieved October 22, 2012. Wikimedia Commons has media related to Harvard Crimson football. "Ten Thousand Men of Harvard"
This page was last edited on 28 January 2019, at 18:14 (UTC).